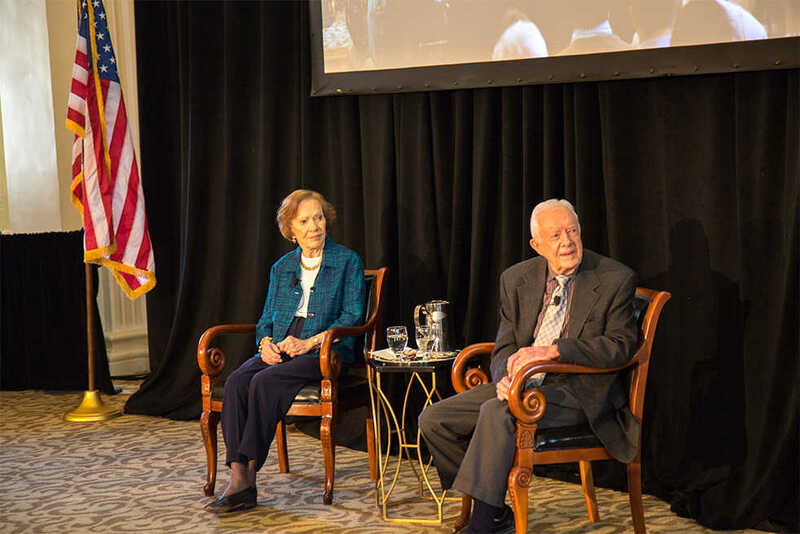 The 2017 Ivan Allen Prize for Social Courage was awarded to Jimmy and Rosalynn Carter during a symposium held at the Biltmore Ballrooms on Feb. 17. Opened with remarks by Dr. Rafael L. Bras, Tech’s provost and executive vice president for academic affairs, the affair initially began without the Carters themselves present. Bras’ opening remarks detailed the accomplishments of Ivan Allen Jr., Tech alum and Atlanta mayor from 1962-1970; Allen is credited by many for having navigated Atlanta through racial integration despite receiving death threats which necessitated police protection for the better part of a year. The Ivan Allen Prize for Social Courage was established in his honor in 2011 and was first given to Sam Nunn. Following the introductory remarks and a brief video on Mayor Allen, a panel conversation moderated by John Pruitt — former anchor for WSB-TV — discussed the cultural and sociopolitical impact of the Carters. Participants included Jason Carter, the Carters’ grandson who ran for Georgia governor in 2014 and serves as chairman of the Carter Center Board of Trustees; Mary Ann Peters, chief executive officer of the Carter Center; Dr. MaryAnne Borelli, professor of government at Connecticut College and specialist in historical female presence in the executive branch; Jonathan T.M. Reckford, chief executive officer of Habitat for Humanity International; Lisa Gordon, president and chief executive officer for Atlanta Habitat for Humanity; and Ambassador Andrew J. Young, former mayor of Atlanta and ambassador to the U.N. under President Carter. The panelists each had an individual presentation with photographs and stories of the Carters, before turning to audience input for questions and broader discussion. The Carters accepted the award from President G.P. “Bud” Peterson during a celebratory luncheon before participating in an hour-long Town Hall with Tech students. Rosalynn Carter also gave a brief acceptance speech, saying that “Mayor Allen was a beacon of light for Jimmy and for me, and for so many others actually in our whole country, for standing up for what was good and right at that period of time.